The easiest way to remove old vinyl lettering from glass is to use a razor blade and hair-dryer / heat gun. 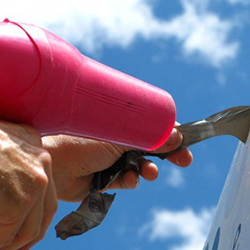 Using the heat gun or hair-dryer, heat up small one foot areas of your text or sign for no more than 30 seconds. Using a new razor blade start at the bottom right corner and begin lifting the vinyl off. Once a large enough area for you to grab with your fingers is lifted, set the razor aside and begin to pull the letter or portion of the vinyl area. Take your time and when the letter or vinyl becomes difficult to remove, stop and re-heat the area again. If any glue residue is left on the glass surface, simply use either rubbing alcohol or lacquer thinner to wipe away the residue easily. Stay up-to-date by following I Like Vinyl on social media!